Recently, BenQ showed several new products. 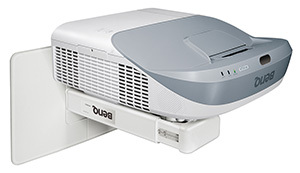 The LX810STD short-throw laser projector features 3,000 lumens and a laser designed for 20,000 hours of life. Connectivity includes an HDMI input that doubles as an MHL 2.1 port for mobile devices. The CH100 is the company's first portable LED projector with high-definition 1,080-pixel resolution and a 20,000-hour lamp-free LED light source. It sports three HDMI inputs and built-in 10-watt speakers for streaming audio presentations. The MW883UST ultra-short-throw WXGA projector includes the PointWrite interactive module option for pen or finger touch annotation and, via an optional QCast dongle, wireless content sharing. The RP653 65-inch interactive flat panel display features high-definition resolution, 20-point multi-touch capabilities and tempered glass with a coating that the company said was "bacteria-resistant" to reduce the spread of germs. Casio will be shipping a new lamp-free projector in June. The XJ-L8300HN offers 4K ultra-high-definition resolution (3,840x2,160 pixels) and a brightness of 5,000 lumens. The company said the device, which combines a laser, a fluorescent element and an LED light in a mercury-free setup, was expected to deliver an estimated 20,000 hours of projection. The model includes a lens shift function for image positioning and a "super resolution" feature to enhance the signal of low-resolution movies and images to produce the effect of higher resolution. The company also recently announced two new lamp-free projectors in its Ultra Short Throw series. The XJ-UT351W and XJ-UT351WN offer an output of 3,500 lumens and can project large images over a very short distance with a ratio of .28-to-1. An optional wireless adapter allows the instructor to control the projector from a smartphone or tablet. Both models also feature the laser and LED hybrid light source, eliminating the need for traditional lamps; the devices have a service life of up to 20,000 hours. Christie has been demonstrating its FHD553-XE-H "extreme-narrow" bezel LCD panel with high brightness, used to create "near-seamless" video walls. The displays come with software for panel-matching and calibration. The company has also produced lampless projectors. The new DHD599-GS and DHD850-GS ultra-short-throw laser phosphor projectors are intended to run 20,000 hours without maintenance and feature 6,525 ISO lumens and 6,900 ANSI lumens, respectively. Christie is also showing its Phoenix EP (embedded processor), which goes into compatible Christie displays to provide a scalable way to manage content on video walls. The Spyder X20 video processor works as a video processor and presentation switcher to convert and route signals to any device or combination of displays. Dell has begun demonstrating a new interactive flat panel display series, which uses FlatFrog InGlass technology for more natural writing and anti-glare glass. The C5518QT and C8618QT are 55- and 86-inches with up to 20 touch points. Both monitors have 4K ultra-high-definition resolution. The monitors include multiple ports for plug-and-play connectivity and wireless tie-ins with the optional Dell Wireless Module. Both models are expected to be released at the end of March 2017. Eiki introduced a line of classroom projectors, the EK-100 series, with four models: Entry-level EK-100W has 3,600 lumens and WXGA resolution; the EK-101X, EK102X and EK-103X feature between 3,300 and 4,200 lumens and XGA resolution. Lamp life runs 10,000 hours in "economy" mode and 4,000 hours in normal mode. The projectors are compatible with inputs up to UXGA and WUXGA and support Crestron and AMX discovery technology. Retail pricing runs from $695 to $995. In January, Epson began shipping its PowerLite 5000 series of projectors. Intended for larger venues, this line features white and color brightness levels of 5,500 lumens and digital inputs for HDBaseT 2, HDMI, VGA, BNC and LAN connections. The system can integrate with Creston, Extron and Control4 systems on the network and includes Epson monitoring software for remote control and troubleshooting. On several models, wireless screen mirroring is done with Miracast, which can stream full high-definition 1,080-pixel content. An optional network module boosts IP security. The lamp has a 10,000-hour life in "eco" mode; in normal mode the lamp lasts 5,000 hours. The PowerLite 5000 models retail for between $1,799 and $2,899. In the same month, Epson also began shipping its PowerLite 2000 series of projectors. Intended for multiple sizes of venues, this line features white and color brightness levels of 5,500 lumens and high-definition 1,080-pixel support for broadcasting video and audio from laptops, Blu-ray discs, DVDs and other media players. The projectors can also display PDF, JPEG, BMP, GIF and PNG files from a USB drive. On several models in the line, wireless screen mirroring is done with Miracast, which enables streaming from a device directly to the projector. An optional network module boosts WiFi security. Two models in the line include HDBaseT connectivity and multi-PC projection to allow up to four PC screens to be displayed at the same time over the network. The lamp has a 10,000-hour life in "eco" mode; in normal mode the lamp lasts 5,000 hours. The PowerLite 2000 models retail for between $1,049 and $2,249, depending on the options. 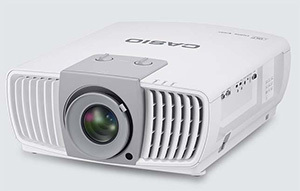 The company also announced a new line of BrightLink interactive short-throw projectors for education. The 685Wi, 695Wi, 696Ui and 697Ui deliver high-definition resolution up to 100 inches — three times as much as a 60-inch flat panel. Brightness runs up to 4,400 lumens. The wireless projectors can allow the instructor to display up to four devices simultaneously from up to 50 connected student devices. The new series introduces "DuoLink," which allows users to put two BrightLink devices side by side for an extended whiteboard experience. Up to eight students can draw, share and collaborate on the projected display at the same time, and teachers can capture images for distribution in PDF format. The lamp has a 10,000-hour life in "eco" mode; in normal mode the lamp lasts 5,000 hours. Models in this line retail from $2,199 to $3,299. Leyard, which acquired Planar in 2015, recently demonstrated new LED video walls. The DirectLight LED Video Wall System series includes four models, each defined by its pixel pitch, from 0.9 to 1.8 millimeters. All use a remote power supply that fits into a 19-inch rack to take heat and noise away from the displays. When installed, the displays are no deeper than 4 inches. The company also introduced the TWS Series of LED video walls, available in the same pixel pitches and offering 16:9 aspect ratio for 4K and 8K resolutions. Single or dual power supplies are built into the display unit along with video and control functions. 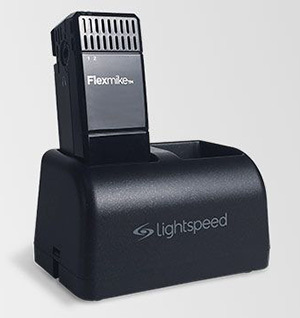 Lightspeed has introduced a new wearable microphone. The Flexmike includes volume controls right on the unit to enable the teacher to make adjustments as needed. The microphone runs on a 2.4V NiMH battery pack, bringing the weight to 1.8 ounces; battery life is eight hours when the unit is fully charged. The power switch includes a mute function. The device retails for $313; however, the company offers education pricing too. As one education user explained, "You plug it in, turn it on and it works. Strap the mic around your neck and go do what you do. Now every student will hear your voice as if you were having a personal conversation with each of them directly!" NEC recently announced a new 34-inch ultra-wide curved display. The two-product MultiSync EX341R line is LED-backlit with 3,440x1,440 resolution, designed with an 1,800R curvature and ultra-narrow bezels on three sides. The display comes with two HDMI ports, four USB 3.0 ports and DisplayPort 1.2 input and output for video sources. A USB hub features the company's "DisplaySync Pro," a feature enabling the user to control two computers with one keyboard and one mouse by using the display to switch between computers. The retail price is $999. The company is also working with T1V, an interactive software company, on a line of 4K display touchscreens. A "base" series is available in 55-, 70- and 80-inch models and includes T1V ThinkHub software, which provides either two or an unlimited number of wireless device connections over a network. The V552-THL 55-inch model, as an example, is priced at $8,856. A "premium" 4K display bundle comes with a 65-inch model (the X651UHD), priced at $22,298, or the 84-inch model (the X841UHD), priced at $32,473. Both are paired with ThinkHub premium software, which supports 4K content. 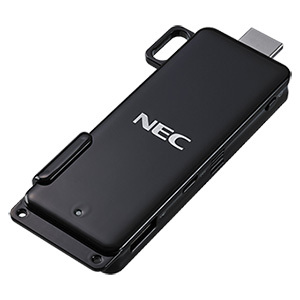 NEC also expanded its LCD projector line with eight new ME series portable projectors. The line-up includes lumen options from 3,000 to 4,000. Multi-presenter software allows for multiple users to send their phone, tablet or PC displays to the screen on a wired or wireless network. The lamp life is 9,000 hours; lamps are covered for one year or 500 hours, whichever comes first. Retail pricing runs from $529 to $949. On the high end, the company announced four LCD installation projectors for delivering ultra-high-definition Blu-ray and 4K content. The new models line range from 6,500 lumens (for the NP-P653U) to 9,000 lumens (for the NP-PA903X) and vary in the resolutions supported. 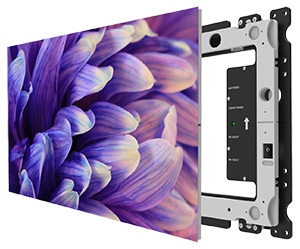 The projectors use NEC's scalar chip, an integrated picture processor that can manage both 4K/60 pixel input and share signal output with multiple daisy-chained projectors. Lamp life is 5,000 hours with a filter runtime of 10,000 hours. Retail pricing runs from $4,499 to $6,199. Late in 2016, the company also introduced the MultiPresenter Stick, a small device for enabling wireless presentations with projectors and HDMI-compatible displays. The DS1-MP10RX1 plugs into the HDMI port to add wireless presentation capabilities for up to 50 devices at once and allows 12 visible at one time in multi-screen mode. On the device side, the user downloads a free app and joins securely by entering a PIN to share content. The stick retails for $329. 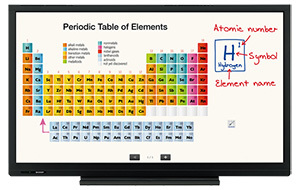 Promethean began showing off its new ActivPanel v5 interactive flat panel series with new ClassFlow Desktop software. 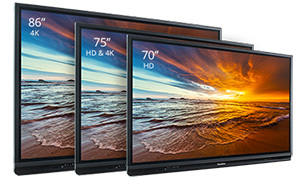 ActivPanel comes in four models: 70-inch and 75-inch in high-definition and 75-inch and 86-inch in 4K. All models include an Android-based processor, which facilitates upgrades of the device's performance capabilities and gives teachers access to educational apps through a built-in app store. InGlass touch and writing technology delivers a more precise and lag-free writing experience. The board allows for palm erase and can handle conversion of handwriting to text. The new ClassFlow Desktop software allows instructors to present lessons on any brand of interactive display. They can also send quizzes, polls and other activities to students' mobile devices; post digital badges to recognize student achievements; and access various resources using ClassFlow Marketplace. Sharp recently launched two new interactive display systems in its Aquos Board line. The PN-C series, available in 70- and 80-inch models, recognizes up to 10 touchpoints with four-person simultaneous use. A backlight control button allows for energy savings during breaks and lets users hide their screens without removing the content. A freeze function enables users to capture a frame from a video for on-screen annotation. Users can also connect webcams at multiple locations to provide expanded videoconferencing capabilities. A "smart" erase feature lets users erase the board with their palms. Smart has launched three new lines of displays, two of which feature iQ, proprietary collaboration technology that allows for integration of personal devices, software and content within the interactive display. On the high end is the new Smart Board 7000 series, with iQ, which features HyPr Touch for more precise writing and touch accuracy and the ability to recognize commands from interactive tools — touch, writing and erase points. The software also enables writing in four different colors of pens simultaneously. Dual proximity sensors activate the board when the teacher walks into the room. This model is available in 75- and 86-inch 4K formats and is expected to ship this spring. The updated 6000 series also includes iQ and comes in 65- and 75-inch display sizes, both 4K. The new 2000 series is a non-touch display with integrated wireless screen sharing, also expected this spring in a 75-inch 4K format.